A damaged horse-drawn carriage stands on a dirt road in the Kappel district north of Pfronten in Bavaria, Germany, on Christmas, Dec. 25, 2018. Twenty people, including children, were injured in the crash between two horse-drawn carriages. 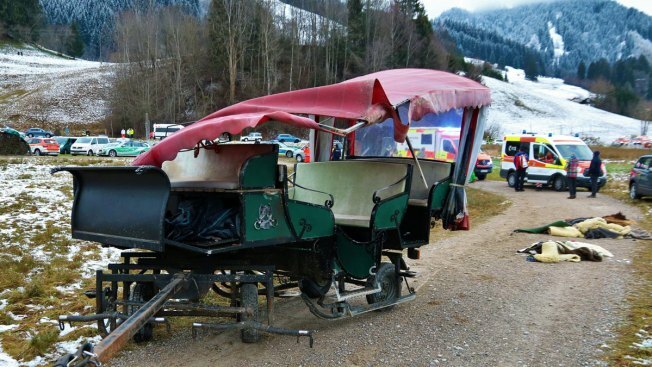 German police say 20 people were injured, two of them seriously, when two horse-drawn carriages collided during a Christmas Day outing. The dpa news agency quoted police in southern Bavaria as saying the two carriages, each with 10 passengers, were approaching a rail crossing single file when the first carriage halted. The second did not and overturned during the collision. One man had to be taken to the hospital by helicopter. Dpa says the driver of one of the carriages was also seriously hurt during Tuesday's accident. The other 18 injured people included children. They all suffered less serious or minor injuries and were attended by 35 medical personnel. Police in the community of Pfronten were investigating on suspicion of negligence causing bodily injury.